Description: These are the notes of a course of ten lectures given at the Christian-Alberchts-Universität Kiel at Kiel, Germany during December 2000. These lectures were aimed at giving a rapid introduction to some basic aspects of Algebraic Number Theory with as few prerequisites as possible. The Table of Contents below gives some idea of the topics covered in these notes. 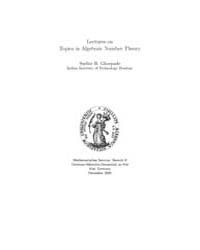 There are two appendices, first containing author's older notes on Galois Theory and the second reproducing a recent article in Bona Mathematica. These notes have a considerable overlap with the ISANT Notes and to a lesser extent, the ICCTA Notes. TOC : Field Extensions - Ring Extensions - Dedekind Domains and Ramification Theory - Class Number and Lattices.